Home › Design Ideas › Don’t Forget the Kitchen Floor! Don’t Forget the Kitchen Floor! Your kitchen floor will really set the tone of your room. We have a lot to say about all aspects of kitchen design, and the place that everything sits on top of is vitally important. When designing your new kitchen, or going through a remodel, this can be of huge importance. There are a number of options you can choose, but it all depends on the RTA kitchen cabinets you are going to install. If you are going for an ultra-modern style, forget it. Wood flooring, or wood mimic flooring is not for your kitchen. The vast majority of the time, the flooring you want will be tile. There are many styles to choose from, and the square tile look of solid colors will most likely complement your modern kitchen beautifully. If you are going for a more classic style kitchen, or a grain wood style, then the wood look is amazing. We here at RTA Cabinet Store have found a number of different options that are sturdy, look good, and will stand the test of time. You could go with real wood, but the whole point is to make your life easier, so you want products that will last forever and be worry free (saving money is nice, too!). Due to this, we offer both vinyl click lock flooring and laminate flooring. Take a look at both, here: https://www.rtacabinetstore.com/flooring. The main difference is that while vinyl click lock flooring simulates the look and feel (without the splinters!) of wood flooring, laminate flooring is thicker, 12mm, and has real wood in it. Costs are kept down with laminate flooring by using high density coreboard for the interior, both strengthening the planks and reducing the need for wood and raw material usage. Both types feature a click together system for installation, with superior durability, antistatic properties, hypoallergenic, and can be used in many places, not just the kitchen. Another great feature of the flooring is the padding that will go underneath it. The padding helps provide a slight cushion for walking comfort, and provides insulation for cold floors, a great idea whether you are laying your floor on a concrete slab or on plywood on top of joists. One of the best things you can do to determine which will be right for your kitchen is to get help today with a free kitchen design consultation by one of RTA Cabinet Store’s professionally trained designers. 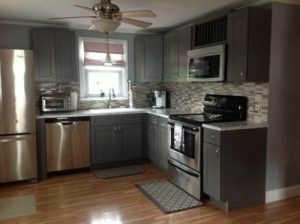 Just go to https://www.rtacabinetstore.com/free-kitchen-design-help or give us a call at (610) 337-5934 to get started!